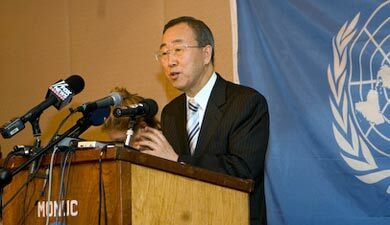 Mr. Ban hailed the holding of the first multiparty democratic elections in the Congo in over forty years, stating that his wish was to meet those involved in the historic electoral process, as well as the UN peacekeepers and everyone responsible for stabilising the country after years of war and conflict. “I wanted to see for myself the remarkable progress that has been achieved in this country, with the holding of the first multiparty elections in 40 years, to meet with the people who were involved, and to deliver a symbolic message, not only for the Congolese people, but for the rest of the world,” he said. Responding to a question regarding the role of the international community in the post electoral process, Mr. Ban stressed the fact that the ‘international community is committed to supporting the DRC’ in this regard, adding that ‘one of the UN’s priorities is the resolution of regional conflict issues, especially in Africa’. With regard to humanitarian aid to the country in the post electoral period, he said that he was ‘sure that this assistance will increase in the future’. During the morning, the UN Secretary General met with Prime Minister Antoine Gizenga and members of the parliamentary opposition, and he also gave an address to the National Assembly. In this address, he said that he wanted the members present to ‘make a contract of good governance between themselves, as well as the people they represent and the international community’. In addition, Mr. Ban said at the press conference that he wanted to ‘underline the importance of constructive dialogue between different ethnic groups’, and to ‘encourage government and political leaders to engage in an inclusive political process’. As part of his itinerary on the first day of his visit, Mr. Ban toured Kalembelembe pediatric hospital in Kinshasa, the only hospital in the country dedicated to treating children with HIV, and indicated that it was a “moving experience” for him. Mr. Ban went to Brazzaville in the afternoon to meet with Republic of Congo and current African Union President Denis Sassou Nguesso, before traveling to Kisangani tomorrow on the second day of his official visit to the DRC. Furthermore, the Secretary General said that he was confident that his meeting with President Kabila in Kisangani would be a ‘positive’ one, and that he was also looking forward to meeting some of the many MONUC peacekeepers that have played crucial roles in maintaining peace in the DRC.